Garage Door Lock Replacement: Garage door locks can over time erode and fail to function properly. In this case there is a good chance you lock will need a complete replacement, we can replace Garage Door Locks of all shapes and sizes once seeing what you have. Garage Door Lock Refurbishment: If a member of our team can save your lock they always will as this is the least invasive work we can do for you. Our team will use special tools and equipment to restore your lock to as new condition if required. 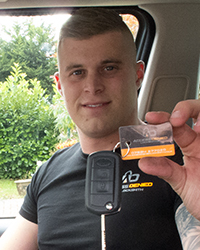 Broken Keys in Garage Locks: Our team are used to having to deal with broken keys in locks of all shapes and sizes from Garages to the cars in them and houses. If you have broken a key in the lock of your garage this can be easily remedied so the lock is still fully usable. Garage Key Cutting / Replacement: In the event of a broken key in a Garage Lock or just keys broken in general our staff come equipped with the tools on hand to cut and shape keys on your premises. We have a customized setup to work on site fast without the hassle of you having to venture out. At Access Denied Garage Door Locksmiths you won’t find a better team willing to provide Garage Door Locksmith services at a better price. We will give you excellent advise and work to make sure that your locks secure and police approved. We will never suggest unnecessary work and we will beat any quote you have had. We have trained Garage Door Locksmiths in the whole of Hertfordshire including the following main towns: Hertford, Ware, Harlow, Bishops Stortford, Sawbridgeworth, Stanstead, Stevenage, Cheshunt, Hoddesdon. We provide 24/7 Garage Door Locksmiths for residential properties. Our Staff are set to be with a customer within 30 minutes of receiving a call so that you get the fastest response possible. We will first discuss your requirements on the phone and provide a quote (This could be subject to change dependent on the situation.) We will then get to work on your garage and let you choose the locks we use in your repairs. For commercial business’s we offer Garage Door Locksmiths contracts to allow our staff to provide on-going support and maintenance to your companies garages across the year. You can choose a tailored package to have our team on constant call or you can choose to call as we are needed to repair or replace Garage Locks for you. We work with the best locks which are insurance approved which is ideal for a company and aim for a 30 minute rapid response time. My garage door lock will not open with a key? This is a really common problem due to erosion over time and in most cases can be remedied without the need to completely replace the lock in question. Most of the time our staff will chose to restore the garage door lock to save you money and this service can be done really fast for you. I’ve lost the only key for my Garage? In the instance where all keys have been lost our pro Garage Door Locksmiths will use professional tools to get you access to your Garage. We will then show you the options available as replacement locks and replace them for you. Door hanging is just one of the skills the team have and if you need someone how can look after you and get your door re-seated we can do this. Our staff will have to come and access the job but will promise the best price. We will get your locks performing as new again and your doors operating correctly. 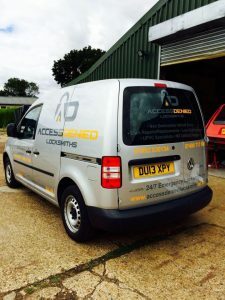 Access Denied have qualified Garage Door Locksmiths in Hertford, Harlow, Bishops Stortford, Stevenage, Hoddesdon, Sawbridgeworth, meaning a member of the team is always within 30 minutes of reaching someone when they call. We know that when a lock needs changing it tends to be at a bad time and therefore we plan to get the job done as fast as possible for you. Call us today on 07534 277020 for a quick quote with no obligation regarding our auto locksmith services.